Columbia Police Chief W.H. “Skip” Holbrook proudly announces that for the first time since the Police Cadet Program was revitalized in 2015, a female cadet is now a sworn police officer at CPD. 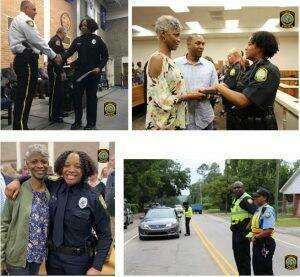 21-year-old Dejha Canty graduated from the SC Criminal Justice Academy on Friday, March 22, 2019 after completing a rigorous and mentally challenging 12-week law enforcement course. Canty, an Alaska native and military daughter was born in Ansbach, Germany. She enrolled in the CPD Cadet Program in April 2017 after exploring law enforcement opportunities online. The Police Cadet Program launched in the late 1970s as a way to help young males and females with law enforcement aspirations hone their skills with the rank and file at CPD. Considered a future leader in the community, Police Cadets participate in organized, on-the-job training which includes instructions in the duties, responsibilities, methods, and techniques of CPD. “The Police Cadet Program allowed me to learn from great mentors to become a police officer. I was able to get a running start on how the Columbia Police Department works, and learn the duties of an officer,” Canty adds. CPD has several veteran officers who have successfully completed the Police Cadet Program; many have gone on to become part of Chief Holbrook’s Command Staff members to include Majors, Captains and Lieutenants. After completing the community service program, Beyond the Badge this week, Canty will begin her Field Training work on patrol in North Columbia.